Why should your care about ELSA? 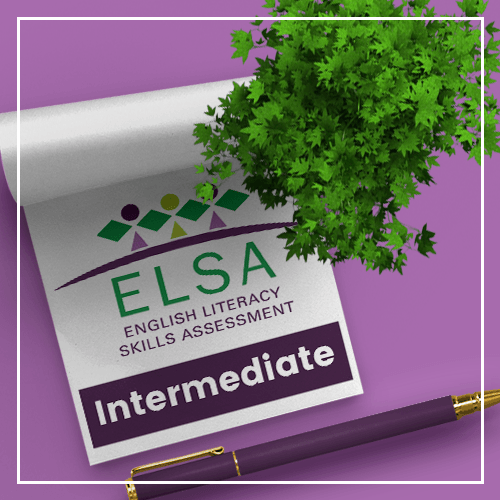 Diagnose English Literacy skills with ELSA​. 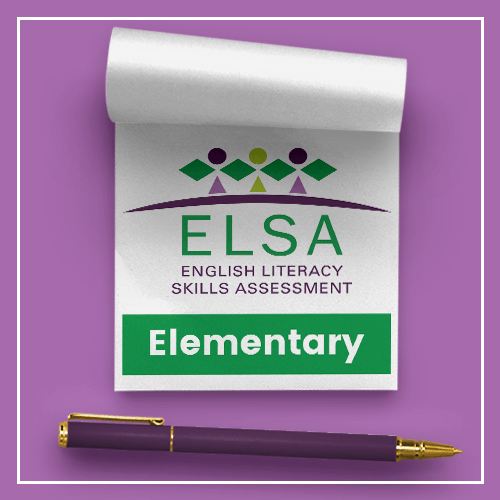 ELSA is an acronym for English Literacy Skills Assessment. It is a language, norms-based, group-measuring instrument that can quantify and diagnose a respondent's English language (and numeracy) skills performance, equating the competency-input performance level to that of a South African English mother-tongue peer. In diagnosing, it shows up an individual's strengths and weaknesses in an English language work/training environment.  It is essentially a prior-learning and placement guide for English (and Numeracy/Maths), but is also valuable to indicate the gap in functional literacy levels in an English environment. The BIG Language problem in South Africa! ENGLISH is the language of the work environment, but it is not necessarily the language of the people. Can you see how truly effective communication can be challenging in a country with 11 official languages? As someone who strives for greatness we urge you to at least acknowledge the magnitude of the 'English literacy skills' -dilemma and how it affects your bottom line in some way or another. ​If you share our passion. 1 in 10 South Africans are English first language users. The rest of us are all over the show. "What exactly is the language of the people?" Elsa is a powerful assessment tool with many different applications. Theunis Horne originally developed ELSA with the intention of using it as a diagnostics tool for upgrading English Literacy Levels. He was a pioneer, who wanted to provide unique solutions to the Literacy Problem by using ELSA to properly define it. The English Literacy Skills Assessment should not be seen as a test for pointing out inadequacies, but rater as a means of coming up with quality solutions that are in direct proportion to the quality of the description of the problem we’re trying to solve. At no more than R200 per unit, ELSA is an affordable pre- and post-assessment diagnostic tool. ​ELSA Elementary measures an individual’s strengths and weaknesses in an English language and training environment. it is suitable for assessing the skills of respondents with education levels up to Grade 9/ABET 4. Companies and Institutions use it as a prior-learning and ABET-placement guide for English and Numeracy/Maths. ELSA Intermediate spans thirteen grades, i.e. Grade 1 to Grade 12+ / ABET 1 TO NQF4+ . It is, an upward extension of our ELSA Elementary. Companies and Institutions use it to assist recruitment, correctly place individuals in development and training programs and to determine the health and effectiveness of their current communication structures. 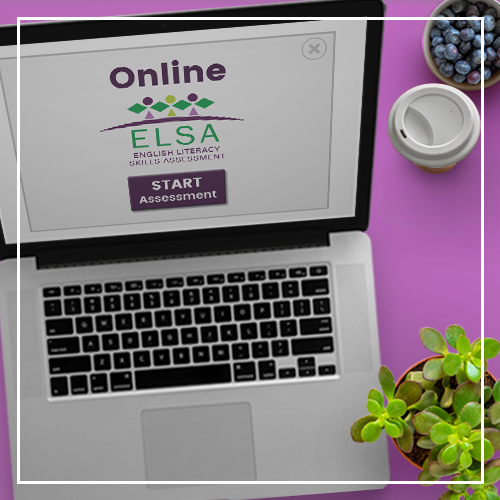 One online adaptive assessment for both ELSA Elementary and Intermediate with immediate report generation. ​Companies and Institutions with access to online computers AND computer literate candidates. ​Individuals who are interested in assessing their own English efficiency to assist planning their future career and development journey. ELSA is a standardised, reliable and valid assessment. It is essentially a scanning assessment; it scans language ability and determines performance levels as per cut-off ranges. It not only measures the integration of listen, speak , read and writing skills, but also the ability to conceptualise and integrate with new knowledge in English. Performance is expressed as at a NQF level, benchmarked against English mother tongue speaker outcomes. The scoring is objective and the functions are mastery, survey and diagnostic. ELSA is not a psychometric test, it measures skills. 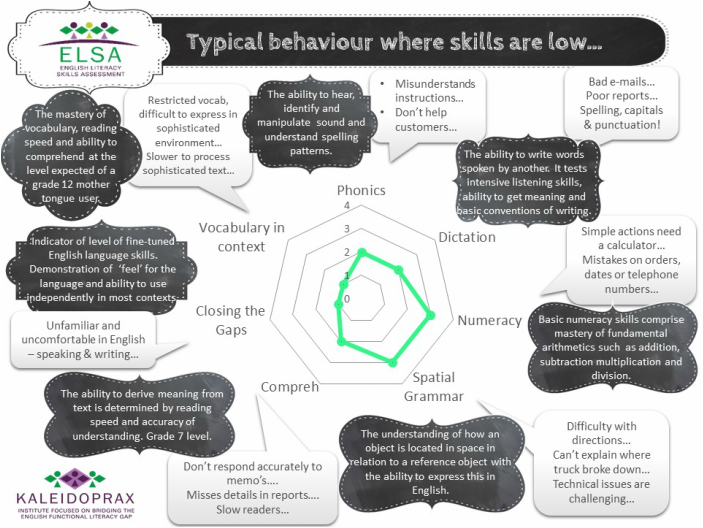 ELSAs are mainly verbal (written) assessments including mixed power and speed testing. It is a Paper & pen assessment, with an electronic version (e-ELSA) for computer literate candidates. ELSA will pick out your potential achievers and identify the ones who don't have the language skills to develop their potential. ELSA will also pick out those with poorly developed language skills. Once they've been identified, their skills can be upgraded. ELSA will ascertain and verify the competency-input levels of newcomers, in particular those for whom English is a second or third language. ELSA will help you determine the English comfort zone of your workforce or student body which, in turn, will enable you to make your instructional materials, in-house publications, standing orders, IR procedures, etc., user-friendly.